Please concentrate so that you absorb everything in this tutorial. There will be a test on Friday. It may be a long slog... but worth it, I promise. Your reward? I will try to refrain in my other tutorials from endlessly repeating various things which are explained here. I would suggest working through this tutorial in several sessions. Trying to absorb it all in a single sitting may be overly ambitious, unless you have a good deal of relevant prior knowledge. Do, please, try to master what is here before attempting my other Lazarus tutorials... there are some fundamental issues, and some are not general Lazarus issues. Yes... if I wanted a application to display time on the screen, I wouldn't require users to click a button to see what the time is! Please understand: this is just a little demo. It has enough in it to be useful for getting you started with Lazarus programming, without having so much in it that you will be overwhelmed. We'll introduce them as they are needed. You can always use the menus, anyway, if you can't find the button you want. This is a tabbed object. In the illustration, we are looking at the components in the "Standard" group. That leaves three windows, across (more or less) the middle part of the vertical dimension of the screen. On the left, we have the Object Inspector. This is terribly important to your happiness while doing Lazarus programming, and we will come back to it. Next is the Source Editor. It already has a bunch of stuff in it! This is the Lazarus- provided skeleton for our application. You will "write your program" here. And lastly, on the right, a Window titled... for the moment... "Form1". This is the form design window. Here you will create the "face" of your application; here you will create what your users see. Don't, by the way, for the moment worry about saving your work as you go along. I'll talk about what a "component" is in a moment. I'll explain why when you hovered over the icon on the component palette, the pop-up said TButton. But let's have a little "fun", first? (A very little, I fear, but some.) Bear with me? In the Lazarus main window buttons is a green "arrow", made of a right-pointing triangle. If you hover over the button I mean, you get a pop-up saying "Run". Click the "Run" button, and be a little patient. Watch the messages window while you wait, and keep your other eye on the "Form1" window. Your application is running! Click the button called "Button1", and your stop application's running. It will be "closed", because that's what you programmed the application to do when that button is clicked! Pretty cool, really... even if we haven't done very much yet. You wouldn't believe all of the things going on in the background. Just think about what your application does when it runs... and there's an awful lot in the background of which you may not be aware, let alone all of the things that had to be provided for by Lazarus to allow you to build this application, be it ever so humble! Run it again by clicking the green arrow button. And shut your application down with "Button1". Not very exciting... but it is all the application can do, so far. Well... almost all. You already have a window which can be moved, maximized, re-sized, etc... That's no small deal in itself. Okay... we've put of saving our work too long. But before we save what we have, just a few more bits and pieces. You mustn't miss or skip the bit above that says "stop you application". If for some reason your button won't stop your application, you can "kill" (stop) it the way you stop any application: In Windows with the little "x" in the upper right hand corner of the window. (Sorry, Linux folks... you have something similar, I believe, but I don't recall if it is also an "x". Can't stop your app? Possibly because you can't find it? It may be "under" some other window. Even if you can't find it, there should be a button on the taskbar. Right-click that, click "Close window". If "Button1: TButton" is highlighted instead of "Form1...", you can fix that simply by clicking on the "Form1..." line. You should have the "Properties" tag selected. not "Events", "Favorites", etc. Scroll down the properties until you get to "Name". For the next few minutes, just press ahead, doing as I say (please), and using the case I use with letters. I.e. if I say type "fish", don't type "Fish" or "FISH". As soon as you leave the "Name" edit box, you will see the stuff in the pane at the top of the Object inspector change. For no reason that I can imagine, the tree structure collapses. Button1 is still there... click the little + in front of ld001f1.Tld001f1, and Button1:TButton will reappear. Look at the title bar of what used to be "Form1". You should now see "ld001f1". Now, using the Lazarus main window menu, click "File | Save"
You should get a normal "Save As" dialog. Move around your disk to someplace sensible, e.g. your "My Documents" folder. Make a folder for your Lazarus programming work. Mine's called "Lazarus". And within that, make a folder called "LD001". "LD001": Lazarus Demo, number 001. 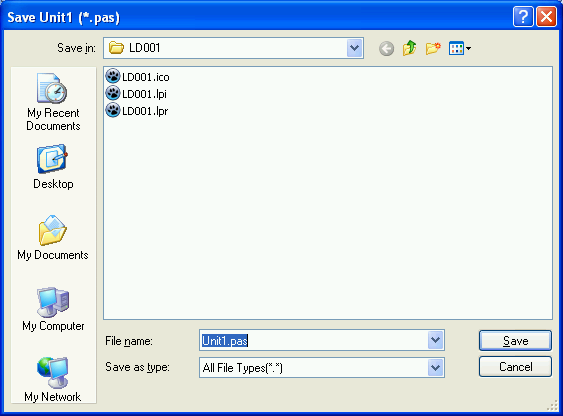 And go into your LD001 folder, and save your project as LD001.lpi. 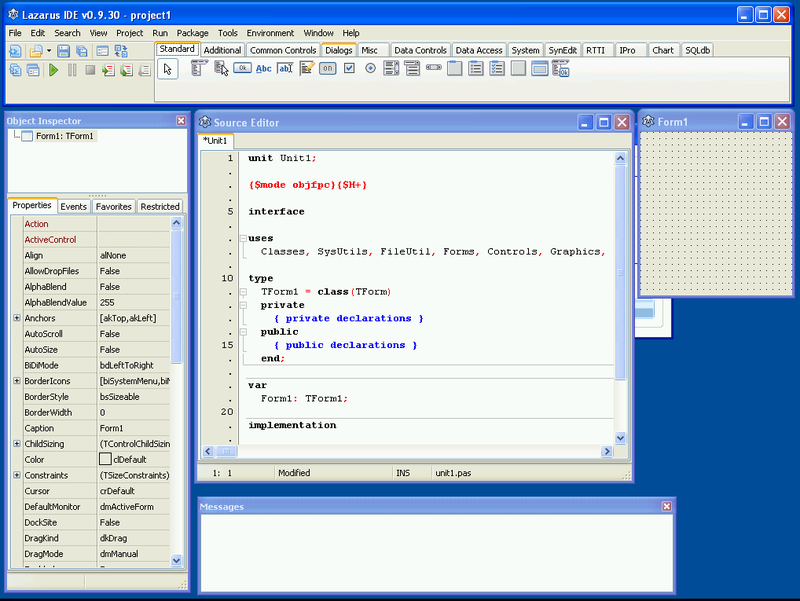 (If you are using this tutorial to learn Delphi programming, the equivalent extension for that environment is .dpr) The default name supplied by the system will probably be "project1.lpi". You only need enter the LD001, without a period after it, as long as you leave the default "Save as type" at the bottom of the dialog alone. Save the unit as "ld001u1", letting the system supply the appropriate ".pas" extension. That's it! We should now have our work saved. We created a folder, once and for all, where our Lazarus work will go. We won't need to do this again, unless of course you want to subdivide your Lazarus work. Within that, we created a folder for this Lazarus project... LD001: Lazarus Demo, number 001. Each Lazarus project is made up of several parts. The project's form, by my convention, not by a Lazarus requirement, is given the name of the project, with "f1" (for form 1) tacked onto it. We don't explicitly save the form's specification, by the way. It is saved for us along the way. The code (and, behind the scenes, the form it relates to) was saved in ld001u1.pas. (The "u1" being for "unit 1". The name of the file with the code in it should only use digits and lower case letters. No spaces. No other punctuation marks... if you want to be "safe". (There may be a few things you could use, but if you stick to these restrictions you won't have problems. I'm a little nervous about using upper case letters elsewhere... that may have been a mistake... but I think I'm going to be able to use the upper case letters, except in the .pas file's name, and they help me perceive what the name is trying to say. Now we have done our first save of the various bits of the project, we can just click on the "Save" button (looks like a diskette) from time to time, and say "yes" if asked whether we want to save changes when we are shutting Lazarus down. I'm not going to tell you again: Save your work from time to time as you develop applications. We have come a VERY long way. The most tedious "crawling" stuff is behind us. Now we're going to make a more interesting button. We're going to make the one that tells us the time when we click it. Just as you did before, click on the button icon in the component palette, and then click on the form. You should now have two buttons on your form, "Button1" and "Button2". Use the Object Inspector to change the names of those components to buQuit and buTellTime respectively. 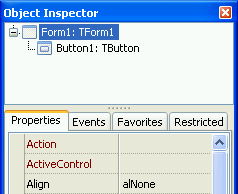 You can either click on the object on the form to select it for the Object Inspector, or click on the object's name in the pane at the top of the Object Inspector. You should see "buQuit" and "buTellTime" on the faces of the buttons. While the names I've given them are good for what we need the names for, the buttons look silly with those geeky names. No problem. ... and run the application, and click the "Give Time" button. Yes, I know... it was supposed to give the time, not "Hello World". Patience! We're getting there! The showmessage() procedure has its uses... but this is not a good application to use it in. You don't want to continually be saying "OK", do you? The fifth item on the Component Palette has "Abc" for its icon, and the pop-up says "TLabel". Click that, then click on your form. Run the application again. Click the Give Time button. Cool! We are changing the value of a property of an object while the application is running! We are changing the value of a property (the caption property) of an object (the laAnswer component, which, as is every other component, is also an object) while the application is running! Not only that... but it only happens when we want it to... when the buTellTime button is clicked. Note that we use ":=" as if those two characters were a single symbol to say "Change what's in laAnswer.caption to 'hello world'". The colon wasn't a typo by me. We use ":=" for assignment. Later we will see things like if bTmp=5 then..., in which case, with the equals sign on its own we will be asking if a condition of equality exists. Also be careful about semicolons. For now, just be sure to put them in when, and only when, you are told to. You'll learn the rules, so you can decide for yourself, soon... but not in this essay... it is long enough already. Isn't it? We're getting closer to our declared goal. .. and run the application. DateTimeToStr() converts things from the "strange form" of Now to the form needed by the caption property of any label. ... is executed in two steps, from "inside" to "outside". First Now provides the date and time, in the "strange form", and then that is converted, by DateTimeToStr to what laAnswer.caption:= needs. Hard to explain. Hard to grasp, on first acquaintance... but you'll soon be using what is going on there without even thinking about it! But you have already heard about many of the basic skills and concepts that you will need. One big area we've hardly touched on: Events and their handlers. You have actually used one, the OnClick event of the buttons. And you created two handlers: One to handle the clicking of buQuit, one to handle the clicking of buTellTime. But I will forgive you if you don't yet fully understand events and event handling. You'll get lots of help with that later.